Studies indicate that bears do see in color. Tests with black bears and polar bears indicate that bears can see color. Researchers Ellis Bacon and Gordon Burghardt of the University of Tennessee concluded that black bears could discriminate between shades of color. Two bears were trained to associate food with a specific color: one bear learned that food was in a blue container, the other identified green. Containers were tightly sealed to prevent olfactory clues. After learning to associate food with color, bears were tested using identical containers in different shades. 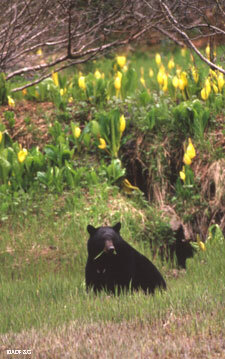 The “blue-trained” bear could correctly discern between blue and blue-gray, blue-green, blue-red and blue-yellow; the “green” bear could discriminate between green and similar shades. Color-blind people can see colors like yellow and blue as different shades of gray, so the study attempted to create hues that would be perceived as homogenous shades of gray. Researchers working with captive polar bears at the Philadelphia Zoo concluded that polar bears see in color. The experiment used a discrimination task similar to Bacon and Burghardt’s test, with ice blocks of different colors thrown into the enclosure in pairs. At any given time, one color reliably contained a food treat and the other color was empty. The bears performed better than guessing would allow, and researchers took steps to make sure that color was the only cue that would signal the right answer. When they had mastered the discrimination, colors were reversed and performance rapidly climbed back to high levels.